Gov. Rick Perry announced Tuesday the state is suing the Environmental Protection Agency over its recent finding that greenhouse gases endanger human health, the latest volley in his administration’s firefight with federal authorities over climate change. Perry, who first sounded the war drums against EPA greenhouse gas regulation in June, touted Texas’ “all-of-the-above energy strategy” and the state’s environmental record reducing nitrous oxide, ozone, and carbon dioxide emissions as he decried the “sweeping mandates, draconian punishments” of the “powers that be in Washington” who are trying "to force a square peg of their vision into the round hole of reality." 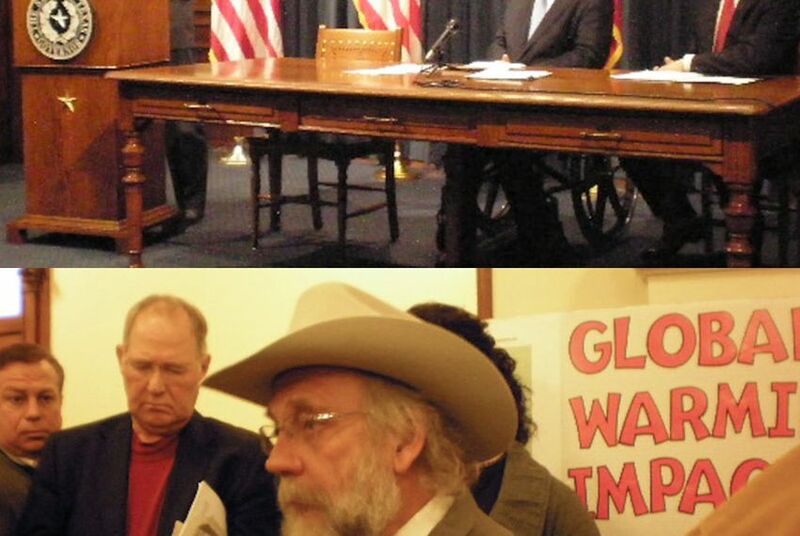 Texas Attorney General Greg Abbott, who, along with agriculture commissioner Todd Staples accompanied Perry at the press conference, moved into climate skeptic territory, saying that the EPA, in relying on data from the UN’s Intergovernmental Panel on Climate Change for its recent finding that greenhouse gases endanger human health, has engaged in a “worldwide miscalculation, sometimes outright fabrication” of climate data. (Abbott, repeating a mistake in the state's legal filings, referred to the organization as the “International” Panel on Climate Change). The state has also filed a petition with the EPA requesting reconsideration of the finding, which lays the foundation for regulation of greenhouse gases under the Clean Air Act. The petition argues that the agency failed to use an objective standard of review when it issued the finding, basing it on “a blind-faith acceptance of flawed scientific conclusions by third parties” — that is, the IPCC. Jim Marston, an attorney and director of the Environmental Defense Fund’s Texas regional office, said it was “terrible lawyering to say that EPA did not independently analyze the IPCC,” and pointed out the finding is “based on a two-hundred-page synthesis of major scientific assessments” from a litany of sources, including the U.S. Climate Change Science Program, the U.S. Navy, the U.S. Department of Agriculture, and the U.S. Fish and Wildlife Service. Perry’s move comes as the IPCC has been hit by “Climate-gate” — in which two top scientists at the Climate Research Unit discussed via email how to manipulate data in favor of climate change. That data was later incorporated into the IPCC report before the emails came to light last year. But Houston environmental attorney Richard Faulk, who chairs the litigation department of the Gardere law firm, said the proceedings are a "process challenge as opposed to a substantive challenge." “There's a lot of talk about science and Climategate stuff in the Texas pleading, but they're not taking on the science full-bore here,” said Faulk, who agrees with the state’s position. Abbott said no other states have joined in Texas’s petition, which was filed in federal court in Washington, D.C. On Tuesday, Virginia and Alabama both announced that they had filed independent lawsuits seeking judicial review of the endangerment finding. According to Faulk, there’s reason to believe that other states, especially those that are heavily dependent on natural resource production, may exercise their right to formally intervene in Texas’ lawsuit on the state’s behalf within 30 days.